Yesterday I took advantage of having some extra hands at home and we did a little clean up in the front woods. All of these trees had fallen and many were quite brittle. In addition to moving the fallen trees we had to tangle with vines. Most of these vines were honeysuckle, Japanese honeysuckle, a good vine to be rid of. While moving one of the trees we were getting scratched and pricked.....after we put the tree on the pile I went back to see what was jabbing us. 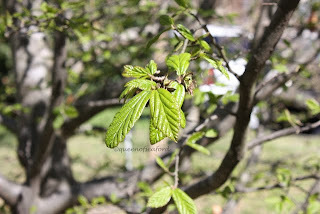 Looks like some kind of Hawthorn, since it is a very small shrub, it is hard to tell what kind. Check out those thorns!! As the trees were being lifted up through the tangle of vines and other small trees, it was easy to manuever into the next property---- except for the Devil's Walking Stick grove. Arailia spinosa is one thorny mess. Yes, I know it is a native (as well as the Hawthorn) but if he comes into my yard, good bye! We also have a few vines that have thorns. Both are varieties of Smilax. This one, Smilax bona-nox also has spines protruding from the edge of the leaf. We all looked like we had had a battle with a wild cat trying to get trees freed from this vine! Here's to hoping everyone is free of thorny issues in the new year! Happy New Year everyone! The snow started late Christmas night. Given the news reports, we were in for a big snow storm. Our news stations are north of Greenwood, one of them is from Asheville, NC. The geographical difference between there and here drive time is between one and two hours, but worlds different when a storm rolls in. Thankfully we just got a dusting. This was the view of the lake first thing this morning. It was snowing from when I got up at seven until about eleven. The direction that the snow blew in was so clear...from the north! The backyard, the deck and the northern exposed areas were covered....... while the southern exposed areas were less so. Look at the trees in the woods. All have snow on the northern side. These were taken on the side of the street that the pines protected the southern side. In the photo below you can see my house through the trees. These two were taken just across the street from ones above. Full of snow cover! The day is warming to above freezing, so the snow is getting thinner.....good photo opts were earlier today, now not so much. Think this Asparagus Fern will come back? Coralbark Maple is super against the white background. There were two Bald Eagles flying around, in and out of the woods. Tough to get a good picture of them. First true sighting of Bald Eagles since we moved in. I did change lens for the last couple photos. While editing those, the Redheaded Woodpecker flew into the yard. He flew from tree to tree, taunting me to get a good shot. Then this sweet little Junco flew to the deck railing, sitting still long enough to get a nice photo. So, everyone, enjoy your snow---I will keep my eyes peeled for more bird sightings. 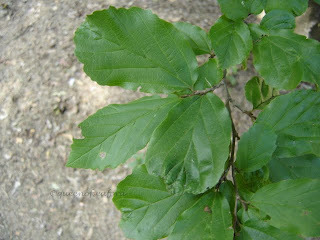 Persian Ironwood or Parrotia persica is a nice tree for use in the urban setting. The only specimen I have seen is the one that is in the York County Master Gardener's Learning Garden. In the beginning I passed by this tree without paying it much notice. That changed in the early spring/ late winter when this tree's blooms stopped me in my tracks. This is a small to medium sized tree, not native to the US. It is hardy zones 4-8 and is happy in sun to part shade. The Parrotia persica is a member of the witch hazel family, looking at the leaves it is quite apparent. The dark green, glossy leaves are obovate, with crenate to serrated edges. It is a deciduous tree and its fall colors are striking....but unfortunately I have no photos of this tree in its fall glory. From my reading the fall colors range from yellow to red to orange-brown....maybe ours was more in the brown range and it didn't jump out at me. 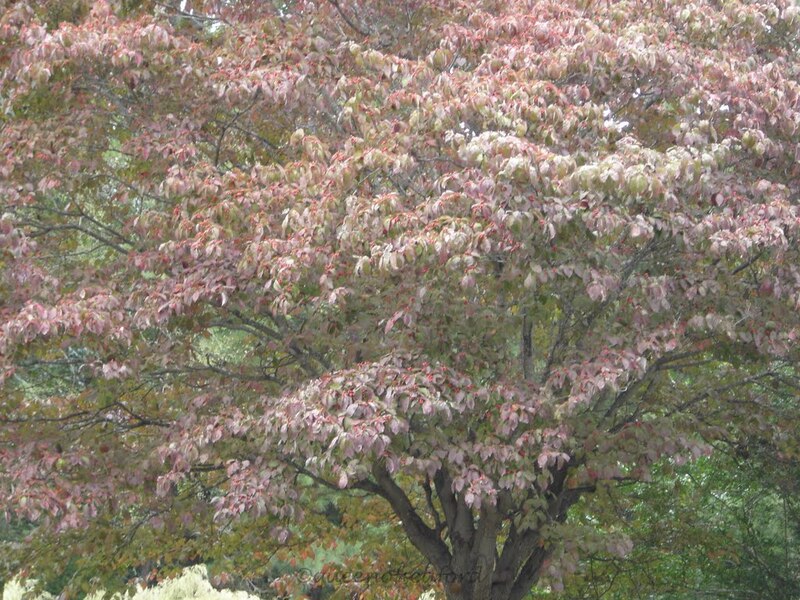 If anyone has a nice fall foliage photo of the Persian Ironwood, please let me know and we can add it. This tree is classified as a medium sized tree. Mature height is 20- 40 feet according to UNCONN and as it matures the bark exfoilates and it a nice feature. It is recommended to limb the branches up to show off its bark. Its branches are ascending and the overall shape is rounded. As I said before it is a street that is very adaptable to urban conditions. It is drought tolerant and a slow grower. There is an old specimen in the Arnold Arboretum at Harvard. This tree is over 100 years old and is 60 feet tall and 75 feet wide. 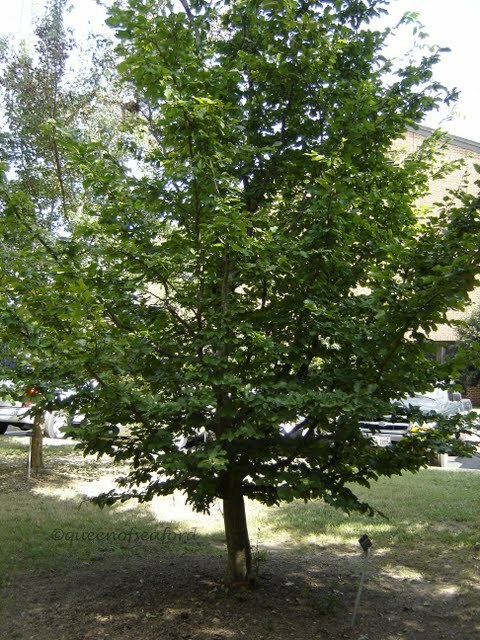 The article from the arboretum has quite a history of the cultivation of this tree. It is a native of Iran, formerly Persia. It was brought to North America in the early 1800's. There are various cultivars in the market today, including a pendula form. Floridata is one of my references, as is Missouri Botanical Garden. Fine Gardening profiled this tree in one of its recent issues which helped spur me into getting back to sharing these trees with you. Please check out these links for some more photos and infomation. Next week's tree ---(in January, taking next week off) will be Yellowwood. I posted this on Facebook yesterday, but since the Great Backyard Bird Count is coming up in February, I thought I would share these two photos with you. There was a car accident in our neighborhood and a tree was scorched. For some reason I am drawn to this tree everytime we drive by. Well, yesterday we saw a Barred Owl. He blends into the background really well. Don't forget to mark your calendars for the GBBC! 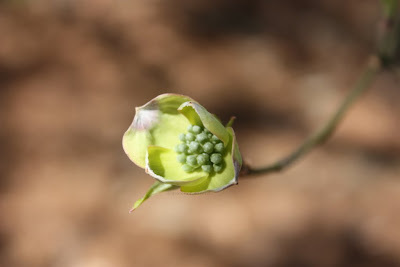 Some of us think of Dogwood in the early spring as their bracts begin to open to show its flower. The bracts get larger and turn white.. Nothing says spring like the dogwood in bloom. 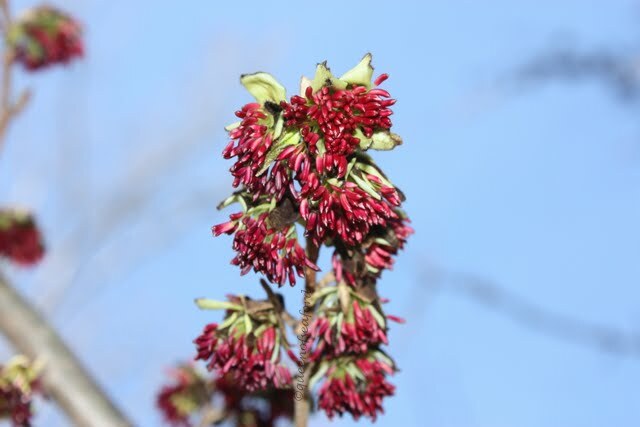 Not sure whether your dogwood will bloom in the spring? Check out the buds for its flowers in the fall. 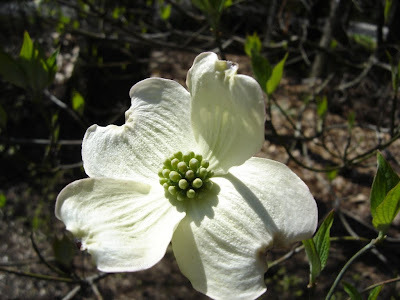 The dogwood is a native tree to the eastern United States, zones 5-9. It is considered an understory tree, one that likes dappled sunlight. That being said, it can handle full sun. 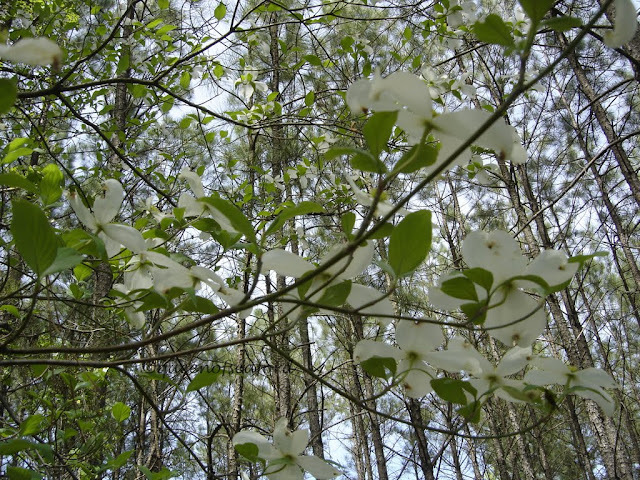 While it is said more shade in the south, I can tell you some of the dogwood I see in Greenwood, South Carolina are in full sun and seem to be doing well. It likes moist, fertile, well drained soils. 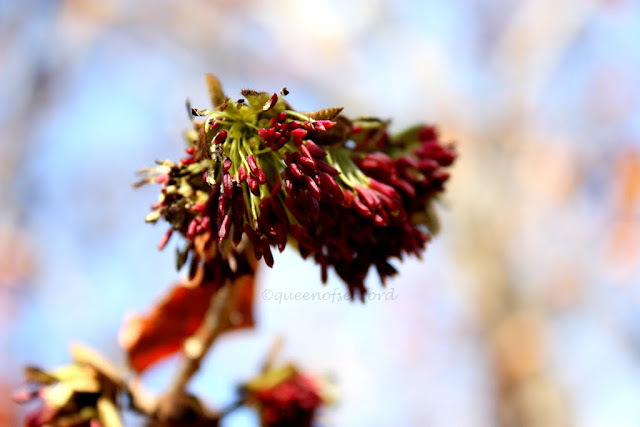 Wildlife benefits from the dogwood's berries. Many birds and squirrels enjoy the fruits. The references say propagation can be done by greenwood cuttings in spring, hardwood cuttings in summer, or seed. We have many seedlings throughout our woods. The leaves are opposite, simple leaves which turn the most glorious red to purple-red in the fall. They are oval to ovate about 3- 6 inches long and half that wide. 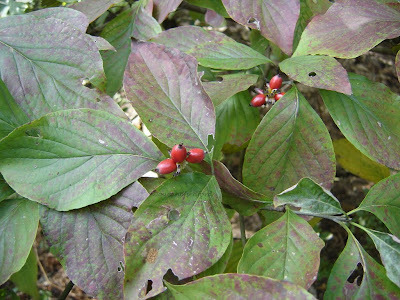 The leaves appear after the bracts open with the Cornus florida. Cornus kousa, leaves are first then the bracts open. In addition to the beautiful foliage in the fall, the bright red berries often make the tree appear to still have its red leaves. The wood is fine grained and very hard. 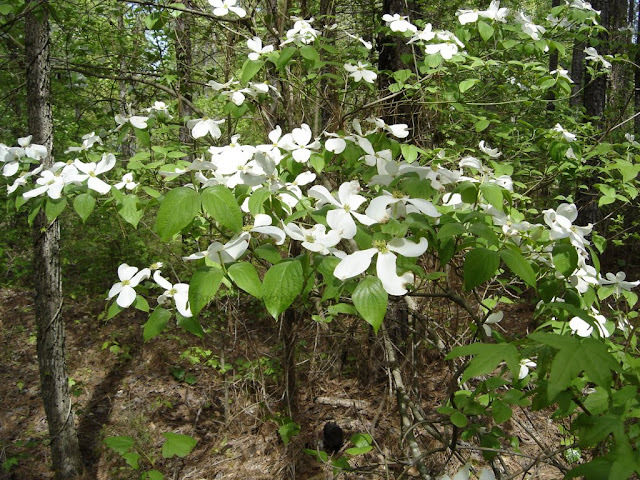 There are many uses for the dogwood timber; tool handles, shuttles, wheel cogs, pulleys, and jeweler's blocks to name just a few. The bark on mature trees is dark and is deeply ridged in small blocks, much like an alligator's skin. The tree can grow up to 30 feet tall. The shape is rounded with a flattened top, branching horizontally. If the tree is stressed it is more suseptible to disease. In recent years Dogwood Blight has spread throughout most of the range of the dogwood. It is an anthracnose disease that thrives in cool, moist weather. 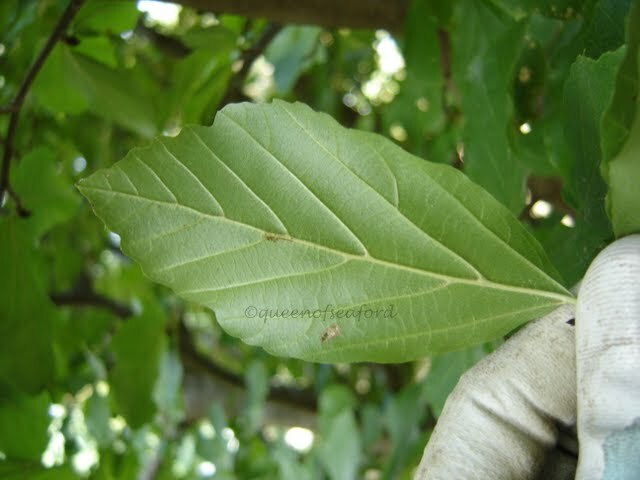 This disease attacks the leaves, eventually killing the tree. 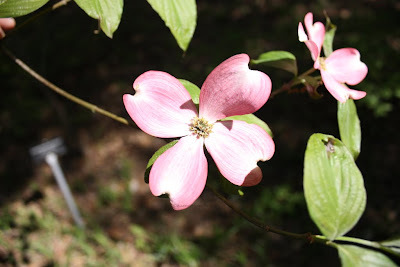 There are different kinds of Cornus, Cornus florida, the native dogwood, Cornus kousa -a Japanese dogwood that blooms about 2-3 weeks later than C. florida and blooms after the leaves have emerged. 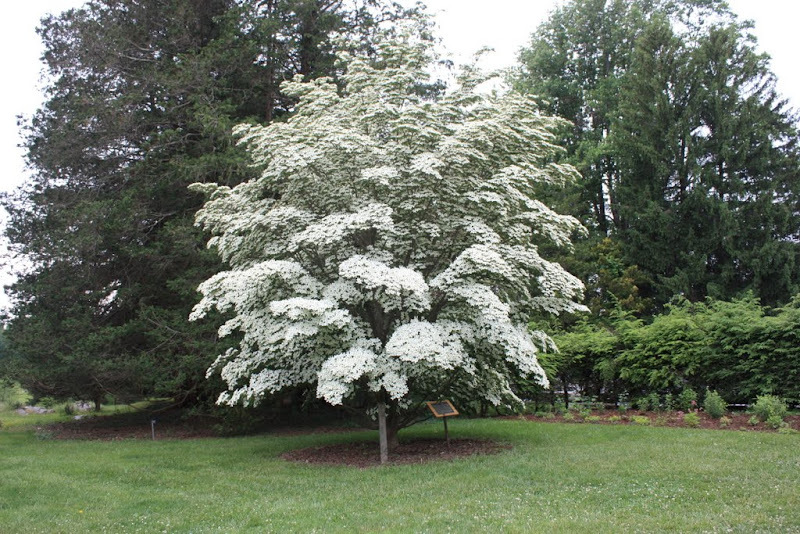 There is an evergreen dogwood that I find most incredible--Cornus angustata 'Empress of China'-- a beautiful tree that in milder climates is evergreen. The bracts are impressive. 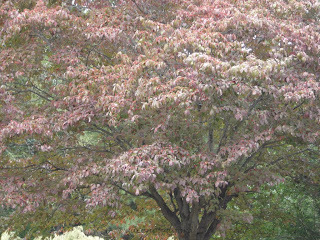 Here is one outstanding tree in the Virginia State Arboretum at Blandy. I believe this is 'Empress of China' but I can't find my notes from the trip right now. You may remember I am big on foliage that turns red in the fall. That is part of the reason that I am profiling this tree at this time of year. The other reason is that the Abbeville Cooperative Extension office sells trees in the late fall, delivery is tomorrow. I bought 3 red dogwoods, 3 redbud, and 2 pecan trees. I look forward to some spring color!! ﻿Do you grow herbs? I know many of you have vegetable gardens, both cool season and warm season veggie crops. Some of you also grow fruit. I used to grow cool and warm season vegetables. I used to grow fruit. I used to grow herbs. Now I only grow herbs. I might put some lettuce plants in some containers on the deck in the spring....and might do tomatoes this summer. For now, I grow herbs. The yard isn't set up for a vegetable garden. That is ok, we have the best farmer's markets. What I really love is having fresh herbs at my backdoor. I grow most of the usual ones---Mediterranean oregano. Looking to find some Mexican Oregano-- understand it has a different flavor. I have a killer recipe for chili that calls for MEXICAN Oregano. Will keep looking. Flat leaf parsley-- what a difference from curly parsley, and dried parsley?? Not even worth it. Salad Burnet, Sanguisorba minor, another evergreen herb. This herb isn't one I cook with, not in the heat kind of cooking. I use this cucumber flavored herb in salads and in my homemade Tzatziki, a cucumber yogurt dish. ﻿This herb adds that extra cucumber boost. Nice addition to anyone's herb garden. One herb I had to search high and low for was one that was in my German herb mix. Fleisch-und-Gyros Würzer, a mixture of Bohnenkraut, Garlic powder, onion powder, salt, pepper, paprika and other herbs and spices. I could find any and all of the herbs except Bohnenkraut. For the longest time I couldn't find the translation for it. Finally I found out it was Winter Savory. Satureja montana, an evergreen perennial sub-shrub, with cute little white blooms in the late summer. Here it is all frosty. I was able to find seeds and grew my own. One can guess as soon as the seeds sprouted, I found some Winter Savory in one of the garden centers. I now have a few plants and I shared some with my fellow Master Gardener Interns. This herb is so wonderful in savory dishes...figures, right! Pork dishes, bean dishes, salads, you name it...savory rocks. One can't have herbs in the garden without Rosemary. Even if you never cook with it, just to rub your hands across the plant and enjoy the fragrance of its leaves. Rosemary is a must have. Thyme is something we all need....both in our food and in our lives. For now my Thyme is in a small clay pot on the deck. All my herbs are on the deck in containers. I have dogs, enough said. I will find a larger container for some of the herbs in the spring. I love the Sage with the frost on its leaves. I use the sage in my stuffing at Thanksgiving and I put it fresh salads. And closer...you can see the leftover bloom. Have no fear---I harvested a few seeds to grow some Basil indoors over the winter. What herbs do you have to have in your garden?